After a year of unbelievable dominance from Ferrari in 2002 – Michael Schumacher finished every race on the podium – Formula One began the 2003 season in fine style with David Coulthard taking the honours for McLaren in Melbourne. As the paddock trundled into the Sepang paddock for the Malaysian Grand Prix few knew what to expect; other than unbearable humidity and the odd thunderstorm. Among the plethora of rule changes for the 2003 season was a new qualifying system. Back came the Friday session to help set the order for Saturday’s make-or-break one lap shootout hour. In addition to an extra session, on Saturday’s the cars would have to qualify with their race fuel loads on board. As a result, the fastest car perhaps would find itself a little further down the order than normal. Renault took full advantage of the new rules in Sepang to take a stunning one-two on the grid. On pole position was the team’s youngster Fernando Alonso. At just twenty-one years of age, Alonso became the youngest driver to top qualifying in F1’s history – he beat previous record holder Rubens Barrichello by around eight months. Behind the Renault pair was reigning world champion Michael Schumacher. The Ferrari team looked fairly shaky at the start of 2003, but the speed in their old F2002 car was still clearly there. 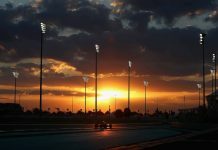 Melbourne stars Coulthard, Juan Pablo Montoya and Kimi Raikkonen would start fourth, eighth and seventh on higher fuel loads. At the start, the predictable carnage ensued into the first corner as the field jostled together. Michael Schumacher proved experience doesn’t make you immune to mistakes as he rather optimistically tried to lunge down the inside of Jarno Trulli. The Renault cut across Schumacher’s bows unavoidably leaving the Ferrari with front wing damage. Trulli fell to the bottom of the field thanks to the resultant spin. Further down the order, Montoya lost his rear wing after Antonio Pizzonia’s Jaguar took a massive bite out the rear wing of the Williams-BMW. In all the mess Minardi’s Justin Wilson made an epic start to leap from nineteenth on the grid to ninth by the end of lap one. Back at the front Alonso was streaking away from the McLaren pair of Coulthard and Raikkonen. Alonso grabbed a new record; the youngest driver ever to lead a Formula One Grand Prix. Unfortunately engine failure on lap three robbed Coulthard of the chance to repeat his Australian victory. Barrichello moved up to third as a result, team-mate Schumacher was still attempting to battle back through the field. It took a number of laps for Raikkonen to make any inroads into Alonso’s lead, but eventually he began to take small chunks out of the Renault prior to it’s stop on lap fourteen. This left the Finn around fifteen seconds ahead of Barrichello who seemed unable to catch the McLaren. After Raikkonen stopped himself on lap nineteen, Barrichello ascended to the front for just three laps before he himself pitted. After the first set of stops, the order read Raikkonen, Alonso and Barrichello. Poor Alonso had been struggling with fever like symptoms all weekend. It was the last thing he needed in what was the most physically gruelling race on the calendar. His pursuit of those in front of him was dogged and incredibly brave for a driver as inexperienced as he was. Raikkonen began to waltz away from Alonso at an impressive rate of knots. His lead was around eighteen seconds when Alonso pitted for a second time on lap thirty-five. The Renault peeling off finally released Barrichello, however, poor tyre strategy choices from Bridgestone (they picked the softer of the two compounds brought to Sepang) left him unable to answer to anything Raikkonen threw at him. Barrichello did manage to jump Alonso thanks to three fast in-laps prior to his final stop of the day. By this point, McLaren began to throw out the ‘EASY’ sign on Raikkonen’s pit board. The young Finn barely heeded the call as he further increased his lead over Barrichello. Further back, Michael Schumacher had finally dragged his battle-scarred Ferrari back up to sixth thanks to some champion determination and luck. Ahead of him were his sparring partner from earlier Trulli, as well as younger brother Ralf, who grabbed a strong fourth place after being woeful in qualifying. Poor Jenson Button just missed out on his first points for BAR-Honda. A costly mistake on the final corner allowed Trulli and Michael Schumacher to speed past him on the run down to the checkered flag. After his staggering start, Justin Wilson sadly had to pull out of the race on lap 41 due to fatigue. The Malaysian heat just too much for the Sheffield-born racer. It rounded off a terrible day for the Brits. 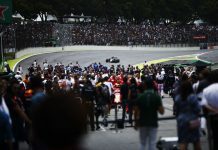 Raikkonen eventually took his maiden win by a massive thirty-nine-second margin from Barrichello, the searing Sepang heat doing little to melt the ‘Ice Man’. Alonso sealed a fantastic third place for Renault despite tailing off towards the end of the race. The result meant twenty-three-year-old Raikkonen was the second youngest man to win in F1, while Alonso was now the youngest man to ever stand on an F1 podium. It marked the start of a new era for Formula One, one that seems to be coming to an end now. These two drivers were once the future of F1, they were the duo who ‘saved’ the sport from the clutches of Michael Schumacher and Ferrari. The 2003 Malaysian Grand Prix was a watershed moment for F1 in the noughties. The old guard looked vulnerable as the rise of the youngsters continued. Sounds familiar, doesn’t it?